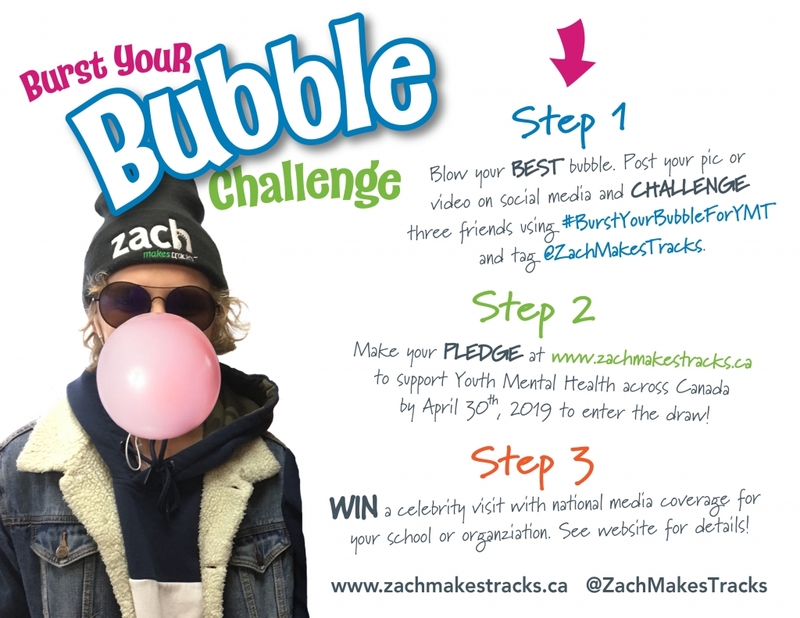 Zach Makes Tracks 2.0 – Zach's NEW mission is to raise 2.2 million pledges of Youth Mental Health support for 2.2 million Canadian Youth! Help Zach collect 2.2 million pledges of support for youth mental health. Zach’s NEW mission is to inspire 2.2 million pledges of support for 2.2 million Canadian Youth. There are 2.2 million youth in Canada aged 13 – 19. We want all of our youth to have access to appropriate mental health services WHEN they need them. Donations raised will go directly to the Slaight Family Centre for Youth in Transition at CAMH in Toronto, and to community based front line youth mental health services – selected by youth – in EACH of our 10 provinces and 3 territories, including The Royal Victoria Regional Health Centre, Zach’s local hospital and where he first began his journey. Specifically, funds will be directed to programs and treatment services that improve access, continuity of care and patient outcomes. Join the #BurstYourBubbleForYMT Challenge and make your pledge today! Your support can change a person’s life. No matter what you do or how old you are, you have the ability to help. Join Zach in taking action and raising funds for Youth Mental Health in Canada. This is how much Zach has raised for Youth Mental Health to date!